Experience has shown that the chainless FN is an excellent vehicle for tourism. It is the best vehicle in use since its maintenance is practically nil, even when used daily. Its adjustment is very easy and less frequent than in the case of any other vehicle. The chainless does not need any particular care. Unlike as in the case of vehicles with chains no sludge or dust can affect the docility of its running. More, the disposition of its propulsory movement, which places the front angle pinion between the handles, effects in the most rational distribution of force and so gives the maximum yield. Thus the chainless is most convenient for those who use their bicycle constantly. The chainless bicycle was introduced in Great Britain in the 1890s. After French Humber’s merger with other leading French companies, the British Humber company marketed the French Metropole Acatene in Great Britain. Quadrant and Rover also sold chainless models. But they did not really catch on with the British public, and few were sold. 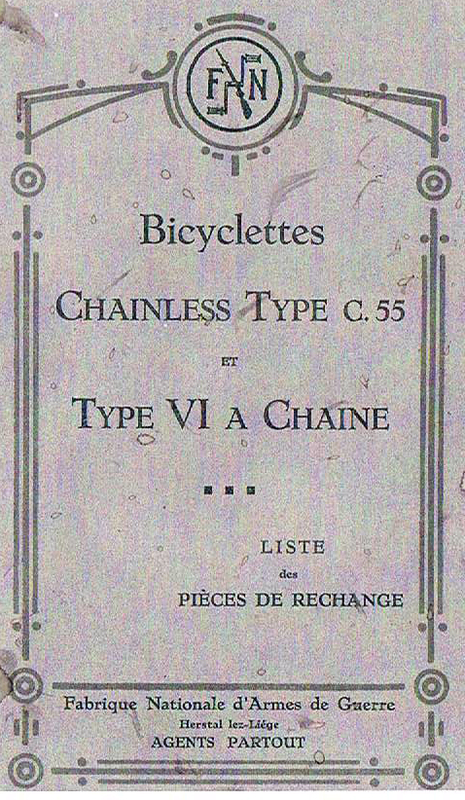 Chainless bicycles were more expensive to manufacture than conventional bicycles, mainly because they required special tooling. FN’s enviable reputation in arms manufacture ensured that its chainless bicycle, like its pistols and rifles, was an elegant design using a minimum of inter-changeable parts with top quality control standards. Although, on first glance, the most striking points of this machine are its chainless mechanism and beautiful wooden wheels, the observer soon realise that its uncluttered simplicity is what actually provides its elegance. 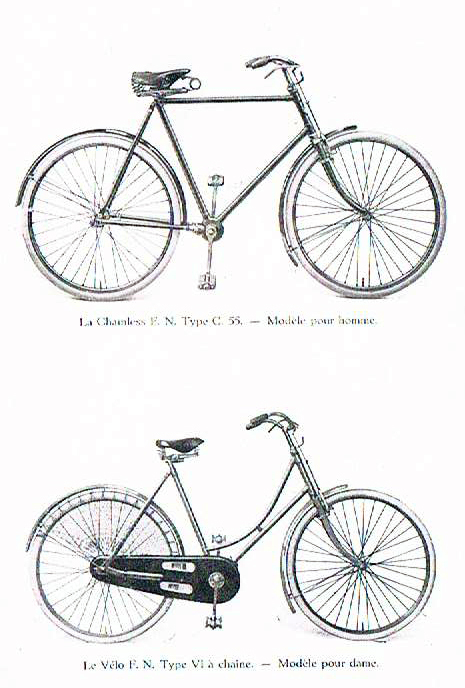 Whereas the later models had celluloid-encased handlebars and a front brake (illustration above), this early example has cowhorn handlebars with only a rear coaster brake, and this lack of ornamentation somehow gives an unconscious sense of freedom. The machine is in good condition all round. I am not sure of its precise age. The frame number seems to correspond to 1903, but forward extensions on front mudguards were not introduced in Great Britain until around 1907, so I have assumed that to be its age. The other fittings are original and early 1900s. The metal-capped wooden wheels are probably American, sold under licence, popular in Europe in the early years of the twentieth century. The head badge is the heavy duty first pattern, also used on the first FN motorcycles (superseded by a small circular badge sometime after 1910). The pedals are early style, as are the cowhorn handlebars and wooden grips. The tyres are 28 x 1 3/4″ (37-622). Those fitted are as I purchased it. I have a pair of 37-622 roadster tyres with an old style tread pattern and without a logo on the sidewall, which would look more authentic. The saddle is 1920s. You can see from the chart below the build-up of lightweight model production to 1914, with optimum output between 1903 and 1909. From the chart below, frame no 6997 appears to be 1903 manufacture.